I love these scarves! These are a perfect gift idea for just about any woman. I have used both drawings and photos to create one-of-a-kind scarves that people admire. I would recommend these to anyone. I have purchased this as a gift two years in a row. Excellent quality! Love it! I had bought the scarf as a Christmas gift for my mother in-law and she loves it. 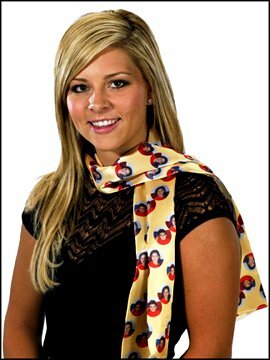 I ordered this item and made custom scarves with one of our logos for new team members that attended convention to learn how to make their businesses a success. The pins were at hit with them and many other consultants. I encouraged many of them to view the web site and hope they choose to place customized orders for our next convention.